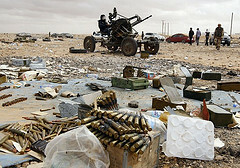 NATO’s 2011 intervention in Libya to prevent the imminent slaughter of Benghazi’s civilians, threatened by Moammar Qadaffi and his forces, was hailed by many as the first real test-case for implementation of the third pillar of the Responsibility to Protect (RtoP) – and a successful one at that. However, the intervention also sparked controversy and raised important lessons about the norm’s implementation. Most prominently, many UN Member States expressed concern that through the course of pursuing United Nations Security Council Resolution 1973, the mandate to protect civilians morphed into something that more closely resembled regime change. A rebel manning an anti-aircraft gun during the 2011 civil war. REUTERS/Goran Tomasevic. This has since led to debates surrounding Security Council monitoring, and the relationship between RtoP and regime change. Three years later, as Libya sits on the precipice of civil war, it appears more lessons have emerged regarding the oft-neglected importance of providing states with post-crisis assistance to prevent the reoccurrence of atrocity crimes, as well as the necessity of employing RtoP measures that straddle the various pillars. Currently, Libya faces the genuine risk of sliding into civil war. Since Qadaffi’s overthrow, the country’s militias have run rampant, with no effective central government or security force to rein them in. Often, these militias have provided the only security guarantee for many of Libya’s tribes and city-states, while informal cooperation – and often competition – with the regular security forces is common. Although a delicate balance of power previously kept the militias from engaging in all out fighting against one another, the election of a new Parliament on June 25th, 2014 dealt a significant blow to Libya’s Islamists. Instead of accepting the results peacefully, Islamists and their Misrata-based allies began a siege of Tripoli and its airport. The goal of the assault was to wrest it from the control of the Zintan-based militias they perceived to be Qadaffi sympathizers leading a counter-revolution. The alliance, named ‘Libyan Dawn’, has gone on to reconvene the former General National Congress in Tripoli, in opposition to the newly formed House of Representatives sitting in Tobruk. Simultaneously, the city of Benghazi has plunged into factional fighting as former Qadaffi General, Khalifa Haftar unilaterally launched operation ‘Libyan Dignity’, with the stated intention of ejecting Islamist militants that allegedly pose a threat to Libyan national identity. As it stands, Libya therefore currently has two opposing governments sitting in different parts of the country, each backed by their own respective armed groups, but neither with any real authority. Militia violence continues to engulf several of Libya’s major cities, with recent reports from groups like Human Rights Watch noting that since taking control of Tripoli and its airport, Libya Dawn elements have turned their aggression on civilian populations. Given this reality, the risk of mass atrocities is perhaps greatest since the 2011 uprising. The recent bout of fighting between rival militias has had devastating consequences for Libya’s civilians. Recent figures provided by the Office for the Coordination of Humanitarian Affairs estimate that over 1,000 Libyans have perished, while 107,028 are internally displaced and an additional 150,000 have sought refuge abroad. Meanwhile, those remaining in conflict zones are experiencing frequent shortages of food, water, gasoline, and electricity. 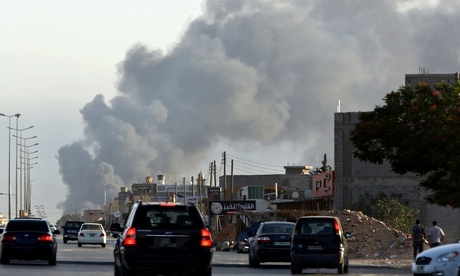 Fighting near Tripoli airport leaves a trail of billowing smoke. Mahmud Turkia/AFP/Getty Images. Amnesty International called attention to the indiscriminate nature of the violence, stressing that “The warring parties in Tripoli and Benghazi have displayed a wanton disregard for the safety of ordinary civilians who have found themselves mercilessly pinned down by indiscriminate shelling with imprecise weapons.” Citing the rising civilian death toll and the damage to civilian infrastructure, they warn that the failure to distinguish between military and civilian targets is punishable as a war crime under international law. Notably, a local civil society organization called Lawyers for Justice in Libya has indicated that on top of the suffering caused by fighting, activists and civil society advocates are being targeted for assassination on a frequent basis, while both state and non-state detention facilities rampantly use torture against detainees, with little hope of due process. The group has warned that “the Libyan state’s ongoing tolerance of such grave acts may constitute a crime against humanity,” and has reminded the newly elected House of Representatives of their responsibilities and legal obligations under international law to prevent such action, and prosecute perpetrators. The situation in Libya has deteriorated to the point that on August 13th the democratically elected government called on the UN to take action to protect civilians and help build state institutions. While specific protection measures were not mentioned, Libyan government officials have since suggested that a UN peacekeeping force tasked with disarming militias is needed. France seems to agree with this assessment, calling for “exceptional support” to Libya, and warning that the country could fall into chaos without UN intervention. Accordingly, recent revelations that Egypt and the United Arab Emirates allegedly launched airstrikes against Islamist targets have been met with condemnation by both the Council and neighbouring states. 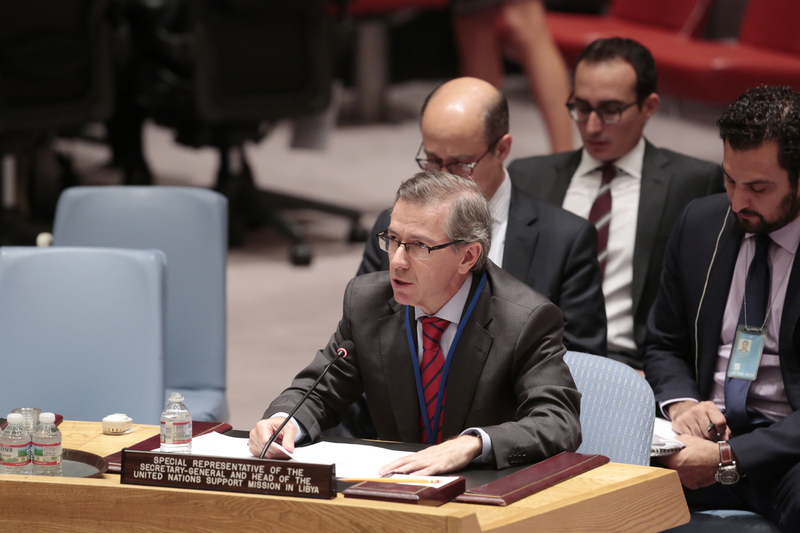 Head of UNSMIL Bernardino Leon briefs the Security Council on the situation in Libya. UN Photo/Evan Schneider. On August 27th, the UNSC unanimously adopted Resolution 2174, which further confirmed the preference to settle the conflict through inclusive political dialogue. Additionally, as head of UNSMIL, Leon has sought to use his good offices to broker a ceasefire – an effort that may finally be yielding results. However, more coercive measures were also laid bare, as Resolution 2174 modified the sanctions regime established in Resolution 1970 to target those responsible for inciting current violence, though the Council has yet to release a new list of names for inclusion. As for NATO’s involvement, the trans-Atlantic organization has been considering sending military assistance to the Libyan state for some time, but seems to have delayed these plans due to the volatile security situation. However, at the recent NATO Summit that took place in Wales, the organization confirmed its support for UNSMIL’s ceasefire efforts, and reiterated its willingness to provide assistance for security and defense institution building, as well as to forge a partnership under the Mediterranean Dialogue. Several atrocity indicators, as outlined in the Analysis Framework laid out by the Office of the UN Special Adviser on the Prevention of Genocide, have persisted since the NATO intervention of 2011. These include, but are not limited to: a permissive environment created by ongoing armed conflict, the presence of multiple armed groups and militias, impunity for past crimes, a history of mass human rights violations, and a lack of credible judicial, human rights, and security institutions. These indicators underscore the importance of international assistance in completing Libya’s transition, as well as for preventing and halting fresh atrocities. The Secretary-General goes on to explain the importance of “building the institutions, legislation, practices and attitudes to lessen the likelihood of…[atrocity] reoccurrence.” This demonstrates that action taken by the international community to halt atrocities can and must also be used as to assist the state and strengthen its capacity to uphold its primary Responsibility to Protect. Update: A previous version of this article mistakenly indicated that Qatar had allegedly launched airstrikes. The article has been revised to indicate Egypt and the UAE as the responsible parties.